This was a slab bench I built for my Dad for Fathers day. I milled all of the wood from our farm with a chainsaw mill to build this bench out a large oak tree that had fallen in a storm a few years back. Since I didn’t have a planer large enough, finishing required lots of sanding and I finished with a teak oil. Nice work! It looks strong and sturdy! Thanks! Yes, I don’t have to worry about the wind blowing this one away! I love seeing a project literally from start to finish. Gives you a bit more perspective into the work that goes into making a piece. Very nice, really cool from the tree to a finished bench! so much versatility when you can mill your own lumber. care to tell us more about your mill? manufacturer, chainsaw specs, etc. I really like being able to mill my own lumber. 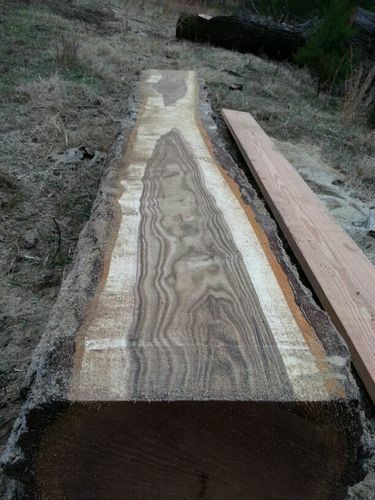 When you cut into a log, you never know what you are going to get. I can mill exactly what I need and we have a large amount of timber on the property so it’s free..which makes it even better. This is a Granberg chainsaw mill, paired with a Stihl MS 360. I bought this to make a fireplace mantel and after I used it, starting cutting boards for wood projects. This little gadget is what actually got me into woodworking. After cutting some boards I realized I needed some wood working tools to do something with all the lumber I was cutting! It takes some time to cut, but I enjoy doing it. I can load it on the 4 wheeler and get to trees in remote places that would otherwise have been left to rot. We have an abundance of Walnut trees on our farm and no way to get them milled so this works for me. I have sawn several stacks of walnut that would have cost me quite a bit if I had to buy. I would like to eventually upgrade to a small bandmill, but this will do for now. I like that freshly cut log. That’s really a large oak tree. Nice looking bench! Nice job on the bench. Milling your own lumber on your own farm makes the project a lot more rewarding. that black walnut makes my mouth water. i mill mainly birch here for projects. no fancy woods in the north. Bushmaster I know what you mean. It’s plentiful here but still makes my mouth water. By far my favorite wood to work with. Great bench, awesome log. Definitely would want all of that. Nice bench! Chainsaw mills are a great way to get lumber from places that aren’t accessible with other equipment.